I've been playing with the next version of ASP.NET, converting a LOB web app to gauge the benefits, and so far I really like what I have seen. 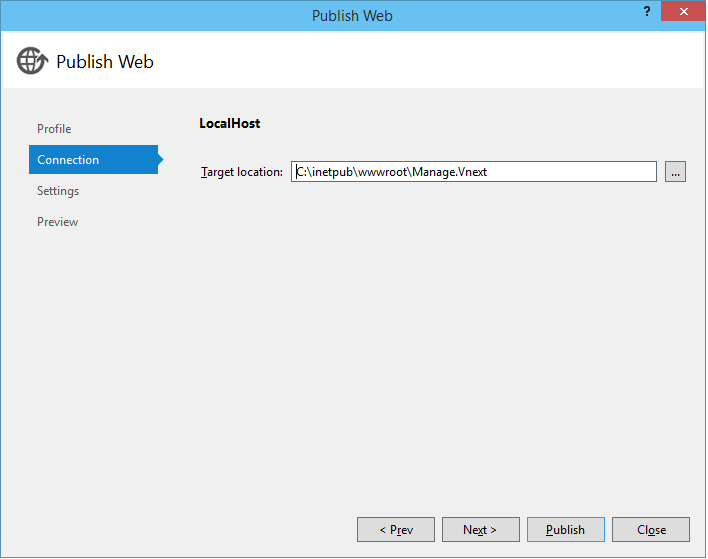 Despite how awesome the new hosting options are, this app will almost certainly be run atop of IIS in production, so having converted some core dlls to asp.net 5 with a few basic tests and controllers up, I set about testing out local IIS deployment. 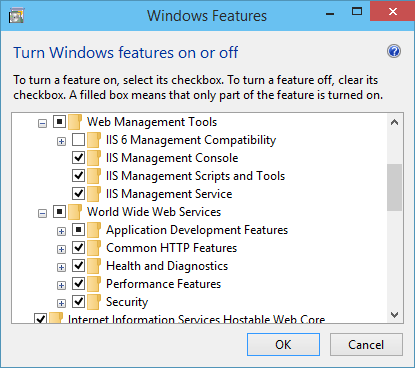 Before attempting it I had to install IIS due to a HDD failure a few days before, I am running a fresh install of Windows 10 TP build 9879 and Visual Studio 2015 Preview. With a nice fresh SSD and not being able to remember which features are required off the top of my head I took the "tick it all" approach. 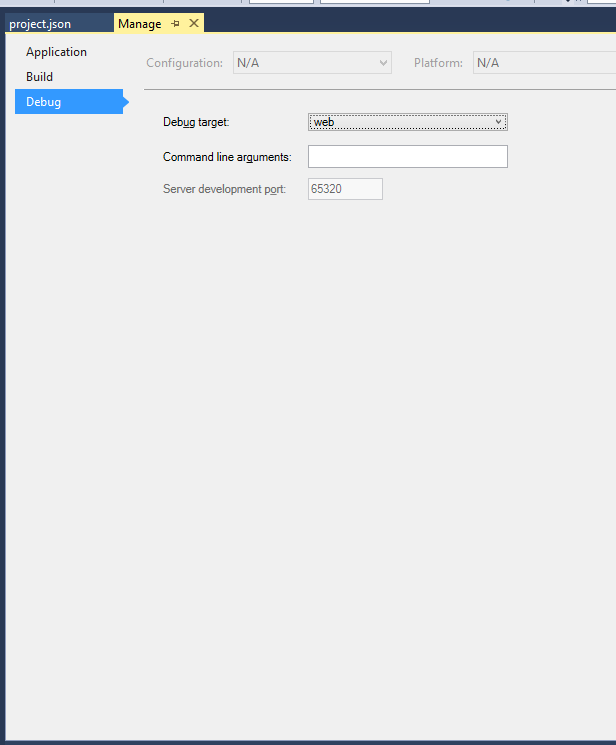 In order to avoid this, you need to go into the project settings and set "Produce outputs on build"
While in the project settings menu, go to the debug tab and change the debug target to web, otherwise any breakpoints you set will not get hit. 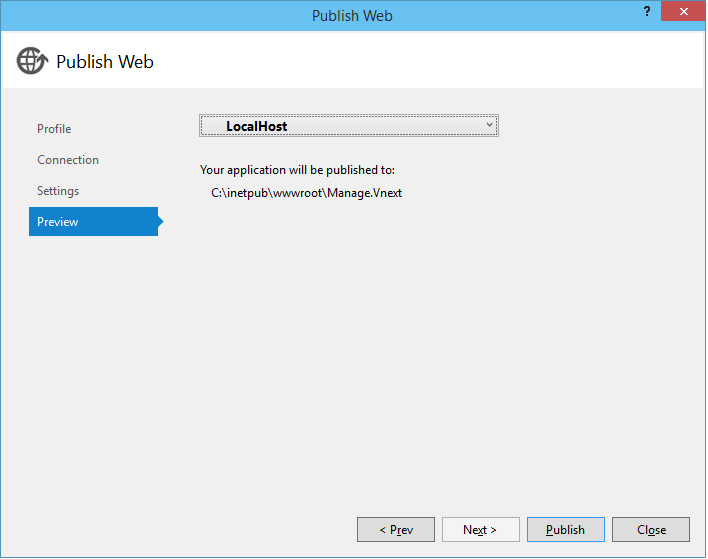 I then updated project.json for the web app project, setting the web command to use the same url as was configured in IIS "http://localhost:80"
Set the connection to the folder above the wwwroot which was created when setting up IIS, in my case that is: "C:\inetpub\wwwroot\Manage.Vnext"
Check your Settings match your targeted configuration and KRE version. 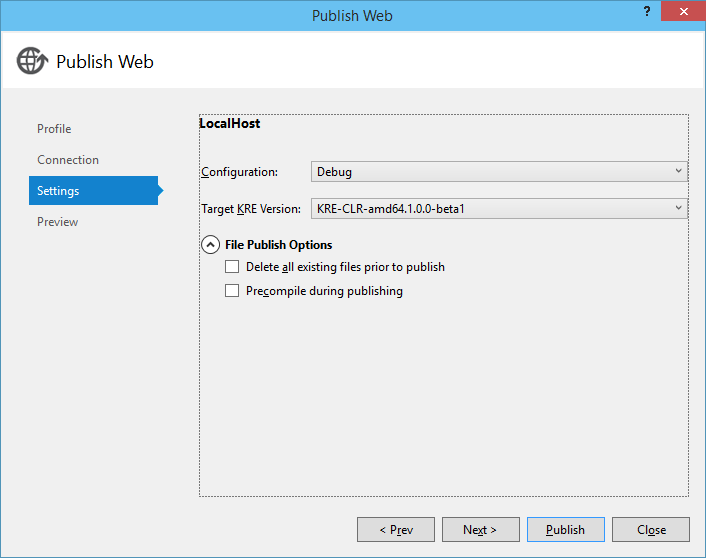 I've tried both the Delete all existing files prior to publish* and "Precompile during publishing" options checked, as well as unchecked and both seemed to work fine. *Be warned: If you have set the connection to the wrong place and select "Delete all" it will delete things without warning, as I accidentally did while figuring this out. 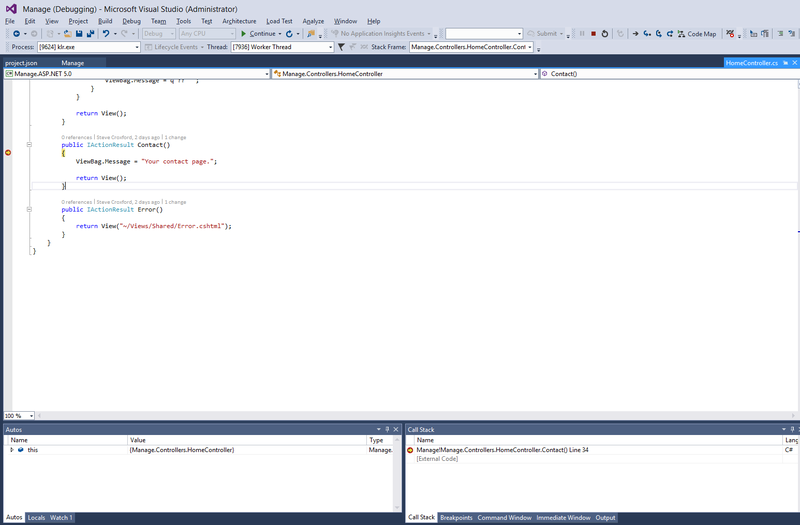 with the debugger hooked up your breakpoints should work as well. 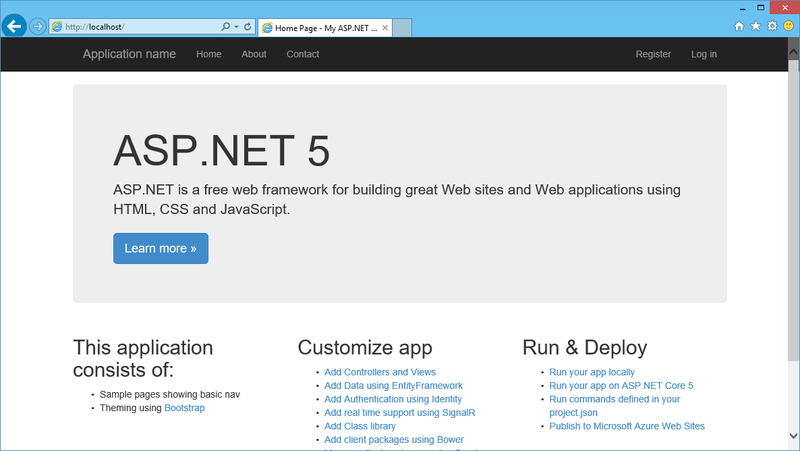 As I mentioned at the beginning I am really enjoying ASP.NET 5.0, even though guides on how to use the new set-up are still sparse, I have found it to be a fairly painless experience porting so far. 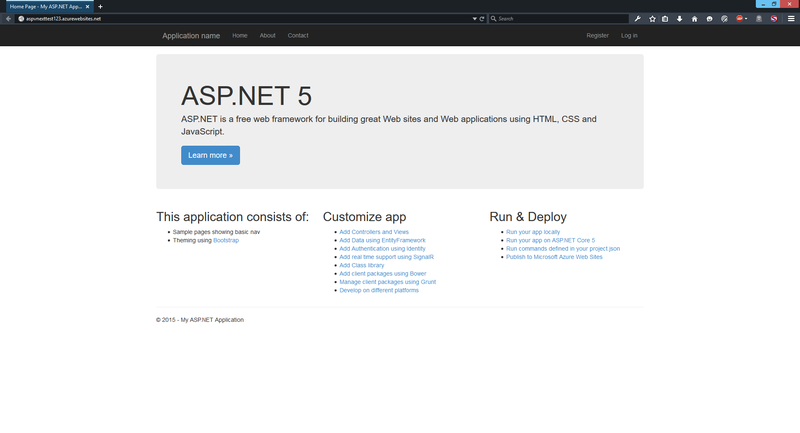 though this may have a lot to do with the fact that the web app I am porting is already running the latest version of MVC 5, and I have yet to attempt porting some of the more complex part's, I am confident it will turn out to be another great leap for Microsoft's tools. Having spent most of my hours as a developer working with the monster that is SharePoint, this is truly a breath of fresh air. I noticed a post on Stackoverflow after posting this, which seemed to have a similar issue, so intrigued I thought I would give it a go. The azure tools defaulted to building a nice free azure website, however these do not support X64 and I was using the amd64 KRE. I had to stop the website and change it to a basic plan, then switch to X64. As I wasn't sure which configuration would be used, I updated the Release configuration settings to match the debug ones discussed earlier. 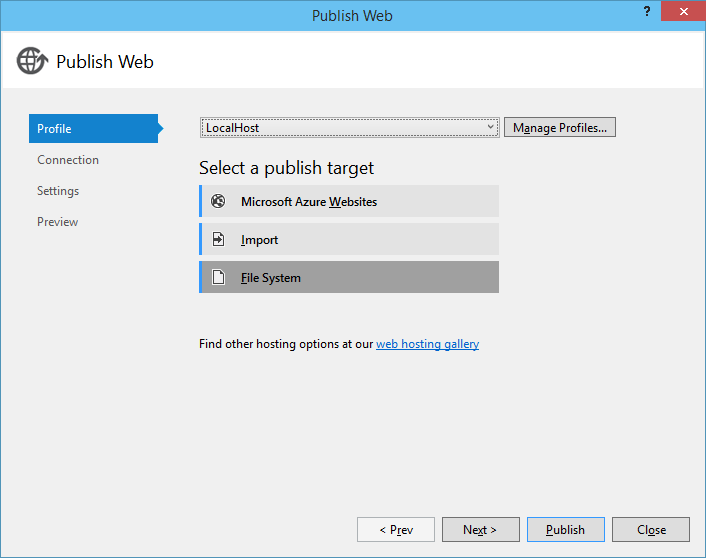 I connected through Visual Studio 2015, accepting the default settings and hit publish.